You know that new Teenage Fanclub (Here) you treated yourself to about a month ago? If it's currently occupying a space in your CD or LP rack, you just might want to clear the slot adjacent to it for the album I'm about to discuss herein. Ostensibly deriving their moniker from the spunky My Generation-era Who song of the same name, The Legal Matters are a Motown trio composed of local luminaries Chris Richards, Keith Klingensmith, and Andy Reed, all of whom I understand had a toehold in previous power pop endeavors. And as far as that ubiquitous nomenclature is doled out like so many Snickers fun-sized bars on a Halloween trick or treat run, the power quotient isn't consistently palpable on the Matters' second LP, Conrad. Luckily this isn't a problem, because much like their maturing counterparts - Posies, Matthew Sweet, and the aforementioned Fannies, volume and riffs aren't as relevant or in demand these days. Carefully measured and nuanced as these eleven songs may be they often exude time capsule-worthy quality control. I likely need not mention it, but the Matters hardly reinvent the wheel here, or for that matter add or subtract any spokes. 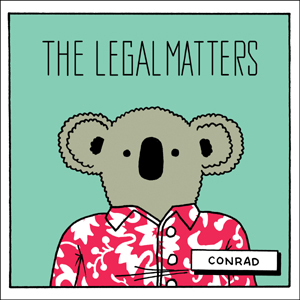 Conrad hardly possesses a revisionist bone in it's anatomy, and yes, you're likely to have encountered the band's modus operandi before, albeit conveyed on behalf of different and more renown artists. Thing is, this trio pull it off effectively without getting bogged down in any sort of pedantic ditch. Their secret weapon? Harmonies, in spades I might add, that are bound to conjure up the timbres of everyone from CS&Y to the Greenberry Woods. From the goes-down-easy persuasion of Conrad's milder fare like "Anything" and "Pull My String" to the more robust arrangements of "Minor Key" and "She Called Me to Say" these lads aim for the sweet spot while deftly curtailing any potential saccharine overload. The Legal Matters make it look all too easy. Truth is these kinda chops (not to mention hooks) take time to hone and marinate...but the main course has just arrived. 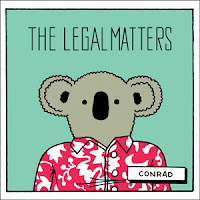 You can find Conrad straight from Omnivore Records, Amazon and iTunes. BTW, the vinyl version of the album is bundled with a download code for a vocal-only mix of the record. ...but they won`t take my love for tender.